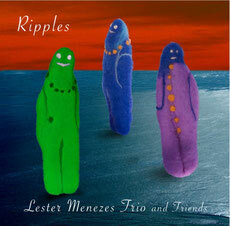 "Ripples is the title of Lester Menezes's first CD as a band leader, pianist and composer (all of the music contained in the CD is written by him). This is a late debut. Lester is not a promising youngster... this is the first outing of somebody who has had time to live in his own garden for a long time; a garden full of plants and flowers from many different places and times and yet all together give shape to a unified statement with a very particular flavor. unpredictable... the sound of the piano is strong and clear, in a territory closer to chamber music than to jazz. Please Hold on! is a romantic adagio full of harmonic colors, with clarinet, cello, violin and viola in a beautiful orchestration that blends perfectly with the piano trio; it is a heartfelt performance of the whole band with a rich and very enjoyable sound from every instrument. Remembrance starts with a lyrical piano solo introduction that evolves with the beautiful sound of Dominique Girod's bass melodic statements in a great flow that eventually becomes a 6/8 vamp where Lester and Norbert develop ideas and finally drive it to an end. This piece's form is totally unexpected and reinforces the mood of a suite where one section takes you to the next instead of existing on its own isolated world. Ripples reappears again in 5/4 but in a faster tempo and piano trio format. The intensity of the piece gains momentum with the piano & drums dialog before the conclusion. With Einsiedeln the strings are at the center of the stage; a beautiful sounding narrative where piano and clarinet appear at certain points while the strings tell the story to its wistful ending. starts with a drum solo, then later a dialog with the melody of the tune played by piano and an ever growing string section over a walking rhythm section, followed by a piano trio free part that becomes really intense, then the strings appear again signaling the way back to the head out. prog-rock vibe (with overdrive included) onto Another Uneasy Peace. Lester's suite keeps finding new spaces in uncharted territory, new surprises that inhabit his musical world. piano; eventually the trio is left alone for a little while, but soon the ostinato is back and the new groove from the drums and bass brings it to the end. Please Hold On! the beautiful adagio, returns with a different orchestration and tempo. This time it is a piano trio and the texture is created mainly with improvised lines with little reference to the melody which was stated on the earlier version. The Fourth Uneasy Piece: again the piano trio in a relaxed but fertile mood, sounding as a unit flowing on a lyrical and romantic mood. Lester alone with the piano again in Reflections, goes back to some of the themes and motives of the suite as if remembering a lifetime. It is clear that Lester likes to explore the awkward, the uneasy territory; he believes in long time commitment to his music and values; there is a serious amount of effort in taking his playing and writing to such a high level of freedom and creativity, and this debut proves that the long patient effort really pays back. Lester's writing and playing is very inspiring, and his musical vision very clear and mature. That, I believe, is the reason why he could put together such a unique and outstanding band for this project; the beautiful sound and phrasing of Thomas Achermann's clarinet, the amazing versatility of Marion Namestnik on violin, Daniel Pezzotti on cello and Simon Wenger on violin and viola, the boundless imagination of Norbert Pfammatter on the drums, coming up with the perfect colors and moods for every moment, and the great creativity and skill of Dominique Girod on bass assure a top level performance of music that truly deserves it.